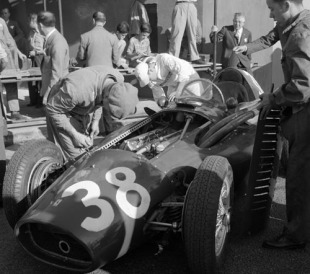 There was nothing up for grabs at the final grand prix of the season in Barcelona - which was won by Mike Hawthorn - but the Spanish Grand Prix did mark the belated appearance of Lancia's new D50. Alberto Ascari, who had left Ferrari for more money in expectation of being able to use the new Lancia, had been left marginalised by its non appearance, and he immediately showed what might have been by taking pole ahead of new champion Juan Manuel Fangio and Hawthorn. However, the Lancias were unready and Gigi Villoresi retired on the second lap and then seven laps later Ascari's clutch failed. A string of other retirements meant that by the finish only nine cars - six Maseratis, two Mercedes and a Ferrari - were still running. For a while Hawthorn tussled with Harry Schell and Maurice Trintignant for the lead, and when they retired it was down to him and Fangio, but Fangio had to drop back when his Mercedes started leaking oil - it was clear to spectators as his overalls were splattered - and was then overtaken by Luigi Musso's Maserati six laps from the finish.